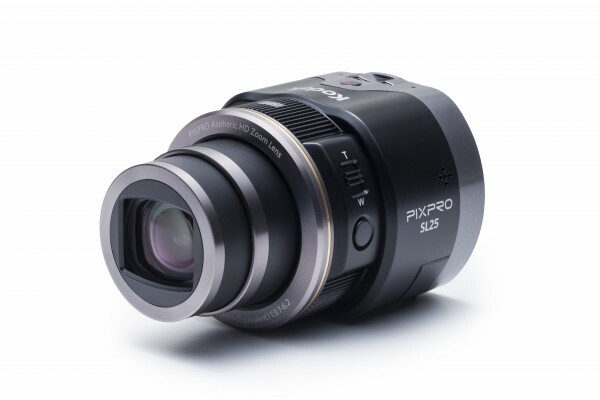 Featuring a 16.35MP 1/2.3 BSI CMOS sensor, the PIXPRO SL25 can record full-resolution still imagery in bursts up to 6 fps as well as full HD 1080p movies at 30 fps. Sensitivity to ISO 3200, coupled with the backside illuminated (BSI) design benefit its use in difficult lighting conditions. A built-in 25x zoom lens, with a 35mm-equivalent focal length range of 24-600mm, benefits working in a wide variety of shooting situations. Zoom position can be controlled on the lens module using a dedicated toggle switch to change between wide-angle and telephoto perspectives. Additionally, optical image stabilization helps to minimize the appearance of camera shake to better enable working in low-light conditions. A unique lens-shaped form factor utilizes a built-in clamp to directly to attach to smart devices for a hybrid shooting workflow. 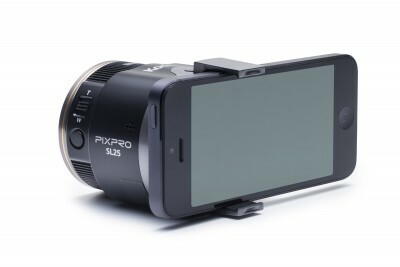 Built-in Wi-Fi connectivity permits linking Android and iOS devices to the PIXPRO SL25 for direct settings adjustment and live view monitoring via a free app. NFC can also be used to pair the PIXPRO SL25 with enabled devices by simply tapping the two together. While designed to be attached to smart devices, the module can also be used independently in order to shooting from more obscure angles or positions. A dedicated shutter release button is incorporated into the module's design as well as tripod mount for steady shooting.